Still some months before its actual release, there is nevertheless some good news – talk of the new compiler from official sources! Any idea how to get into the beta testing of this [new] Delphi? Thoughts, however, quickly turn a touch negative, for it appears that not all traditionally bundled functionality will make the transition. Moreover, what about the support for a certain non-Windows OS, which is unfortunately missing from the released details about the upcoming release? Should the omission […] cause me to lose all hope of ever finding Delphi, an excellent RAD environment, on […] an excellent OS? As for what has been implemented, the news isn’t too hot either – for in a lame decision to follow what MS has done with their C compiler (don’t they even realise Delphi isn’t C? ), they’ve kept Integer and Cardinal the same size changed the size of Integer and Cardinal! I can resist no longer. What world do you come from? Certainly not Borland Pascal, which is what Delphi is! You miss the point of the original post. Making new code work with old versions is NOT the point. The problem comes trying to use existing code written to [their own] standards. Of course there are ways to modify old code to work with the new standards. But [they have] changed the standards. Why? I’ve seen LOTS of code that does this. I should imagine so [i.e., that such code will have to be changed], but I sincerely doubt the new type will be simply called “string”. We tried to make the transition as transparent as possible. Most code will convert straight across with no changes. Other will have to be modified slightly depending on how much they depended on the physical layout of the string. I am unconvinced that [they are] not making a big mistake to *redefine* old types and make new types constant. It does not make sense to me. 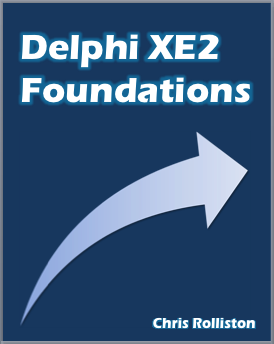 There are some fairly obvious questions about the next release of Delphi that I have not seen discussed yet. (1) When will it be available? (2) Will the documentation be improved? Happy New Year, Chris! Sorry, I can’t understand where you have found the quoted sentences? The link is right at the end, in the superscript text. Search Google Groups for “Borland to show 32 bit Delphi” if it doesn’t work. It is funny that you seem to regard me as a Delphi fanboy, especially with all the work I am doing in other computing areas as well. I am interested in Delphi, as it makes me productive in certain areas. Just like xCode, .NET, batch files and Linux make me productive in some areas too. Yes, I have been an early adopter of Delphi, just like I have been with other platforms as well. God help anyone for whom english is not their first language trying to read this blog post. God help anyone who has a sense of humour bypass. Your post is very confusing. I can see the point you’re trying to make (just) but I think you could have found a better way to express it. What point would that be? I merely came across an old thread for the D1->D2 transition, and found it mildly amusing how the sorts of criticisms directed towards Borland, and defenses of Borland in return, mirrored the criticisms and defenses of Embarcadero now – hence the title of the blogpost. What else is there to explain…? That has nothing to do with humour. I think my grasp of the language is fine, and my sense of humour is well developed too, but there is nothing in your blog post (except the comments and the fine print at the very bottom) that shows you are quoting from a very old thread in the borland.public groups. Great stuff — fun to find a post by me in there….. Indeed! It was a shame I couldn’t think of a way to allude to the fact.